Khaki love at Dockers - Hello! Welcome to my blog! If you ask me 8 years ago to wear khaki, I would slap you with a pair of jeans. But things change when I explored other stuff as I got exposed to fashion and events. Never been a khaki guy and before I thought I'd never have a pair but then I saw a guy pull if off and looked good at the same time and I thought, "Hey, why don't I give it a try". Dockers has been making authentic khaki for over 25 years and has certainly changed and revolutionized khaki forever. This Fall Season, the brand introduces its most diverse collection yet. To welcome the latest additions, the brand is treating the dashing men of the Philippines with a celebratory promo. Shopping at Dockers stores from August 2 to September 1, 2013 will be twice as fun, with customers getting a 25% discount on their purchase. 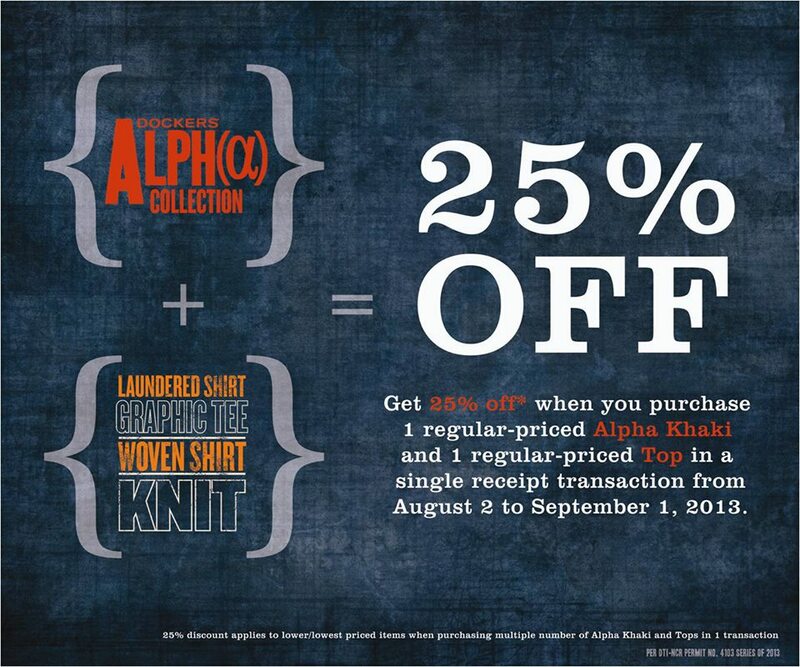 Purchase one regular priced Alpha Khaki and any one regular priced top in a single receipt transaction. Nobody knows khaki better than Dockers, and with its new series, the Alpha Collection, men are about to rock it like never before. Boasting a range of designs and pieces that create complete, head-to-toe looks for casual days out or more formal gatherings; weekdays or holidays; work or play, the new collection is ready to take anyone anywhere. 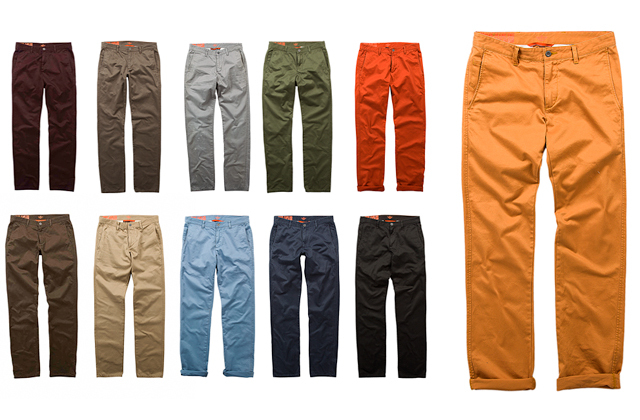 Dockers Alpha Khaki gave the khaki world a run for its money. 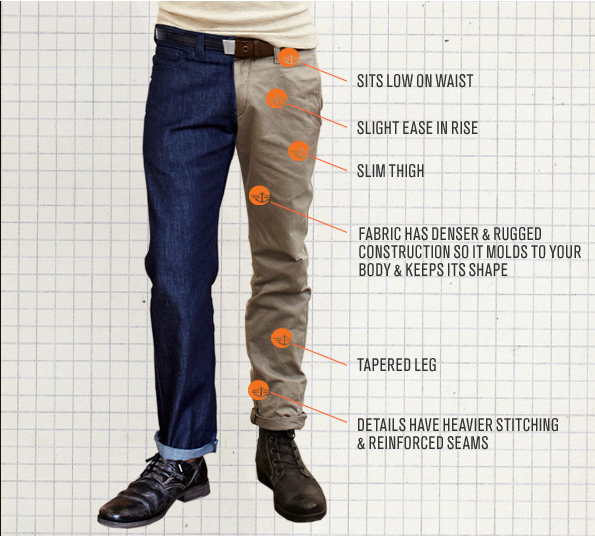 Dockers completely transformed khakis. They inclded two new pant fits in its range—the Alpha Skinny Tapered, which offers a razor-sharp look; and the Slim Tapered Alpha Khaki which sits slightly below the waist, has Tapered leg opening, and designed to flatter with a silhouette that sits relaxed on the waist and hips and drops slim to the legs. It also offers some of the season’s bolder color options, including brick red, old rose, pesto, light blue, Portland brown, black, midnight, dark pebble, gravel, azul sea, electric blue, true olive camo, white wash and navy. So if you want to make a statement, Dockers is the way to go for you. Timeless and perfect for any occasion, a pair that has versatility, quality and innovative. Let's head now to Dockers guys! Dockers stores are in Trinoma, Cebu JETT, Centrio CDO, Landmark Makati, Landmark Trinoma, Metro Gaisano Market Market, Metro Gaisano Ayala Cebu, Metro Gaisano Marquee Mall, Gaisano Mall of Davao, People’s Mart Pagadian, Cash & Carry Makati, Robinsons Metro East, Crossings Department Store Edsa Shangri-La Mall.